Jared was one of the Senior Art tutors of the “Next Level” legal arts program developed by Shauna McGilvray. Redirecting of youth into legal art pursuits. Allowing youth a safe environment with legal graffiti. 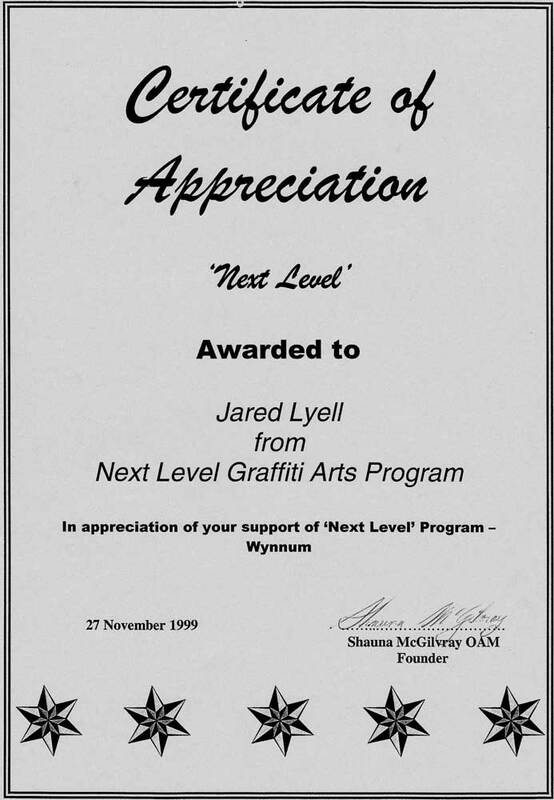 A subsidiary of the “Next Level” program is “Graffiti Alert Project” cleaning up graffiti program of which Shauna McGilvray was the founder. Jared Lyell was also in Cherbourg helping the aboriginal youth in painting the radio station “Cherbourg’s Community Radio Station” “Us Mob Radio”. The unusual and exciting approach that Jared employs, utilises bits and pieces of paper and sharp implements, to move the paint around while it’s still wet to create dramatic and breathtaking paintings that is the new modern art. Large crowds gather around Jared with intensity as they watch him create masterpieces of art. 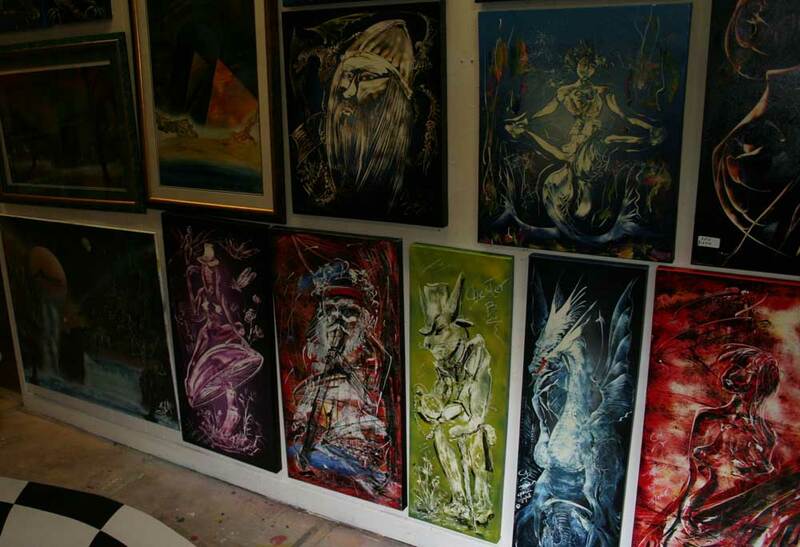 Jared has held numerous exhibitions throughout Queensland. The 1st of Jared’s exhibitions was opened by the Mayor of Ipswich, Cr John Nugent OAM, in February 2000. One of the recipients was Torchbearer James Holcombe, 14 year old sufferer of Muscular Dystrophy. 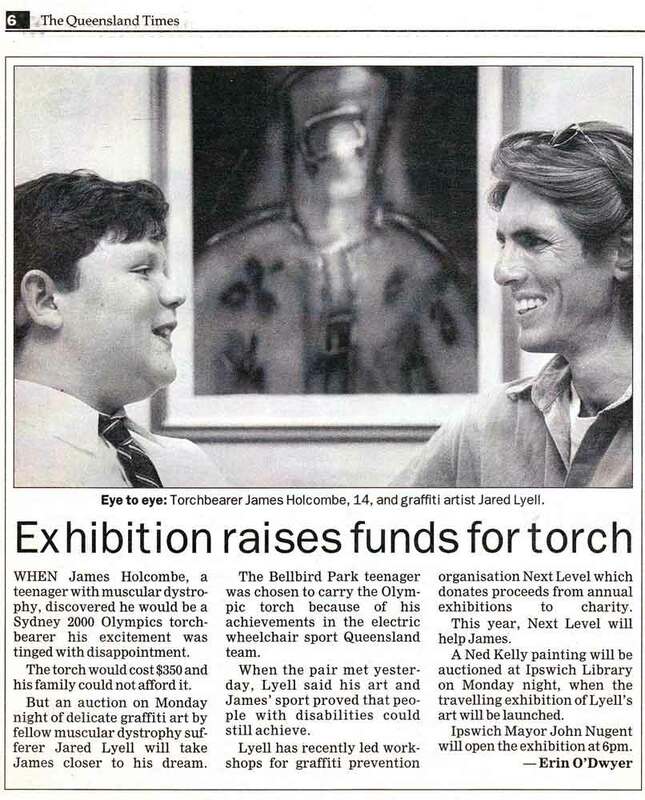 The exhibition toured throughout Queensland and was very successful in helping raise much needed funds, where the proceeds of the sales went to benefit Muscular Dystrophy research. Jared had the honour of presenting one of his paintings to the Lord Mayor of Brisbane, Cr Jim Soorley. The painting now takes pride of place in Brisbane City Hall where it is on public display. 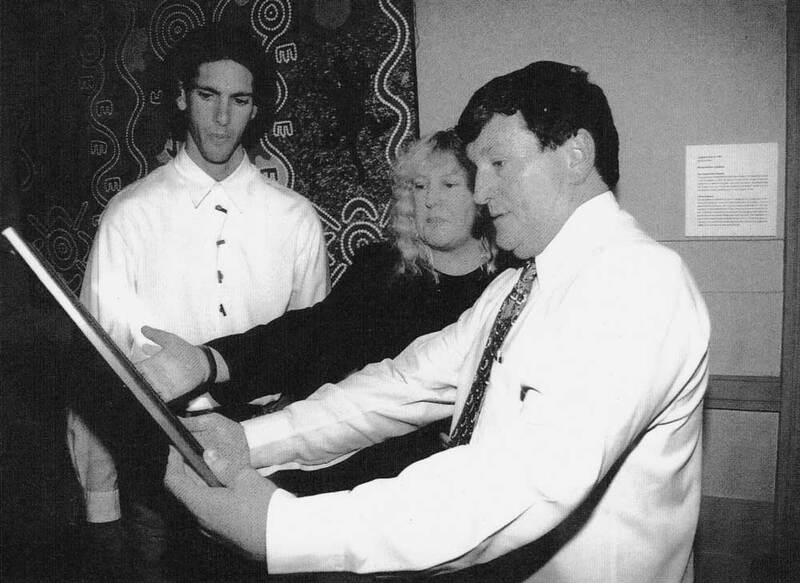 Shauna McGilvray and Cr Jim Soorley admiring Jared’s painting on December 7, 1999, Brisbane City Hall. Cr David Hinchcliffe (councillor for Central Ward including activities in the Central Business District as well as a practicing artist) has stated “Jared Lyell has set the standard for showing there is another use for spray cans other than for graffiti or the illegal use in defacing property. And showing people on all levels from young to old performance in great skill and creativity. Jared Lyell adds colour and life to the Queen Street Mall end of Brisbane. He has been interviewed many times and is in articles around the world. He is an attraction a drawcard for Brisbane and has been admired and looked up to by many people. Jared has created a style of his very own and is unique in the form he uses. It is good to see that Jared uses a customised breathing apparatus for his health. Being in an open area helps as well. Jared also uses Hand Shield Liquid Gloves, for protection as his hands are covered in paint all the time. People have a right to stand there and watch and also the freedom to walk away if they want to”. Jared was part of the CBD gallery (in Brisbane with Founder David Hooper) a major contributor to the arts. And also as a mentor to many of the local artists of Brisbane. David Hooper CBD Gallery Brisbane 2007. All of Jared’s paintings are Original. Signed by the Artist. the paintings can travel safely and be posted anywhere. Jared is also happy to paint custom orders.